CEC are concerned with the reliability of solar panels entering Australia, and are taking steps to address it. On Thursday I attended the All Energy Conference and saw a presentation by Sandy Pulsford of the Clean Energy Council on solar panel quality. The gloomy skies above Melbourne that day well matched the bad news he gave about the quality of some solar panels in Australia. 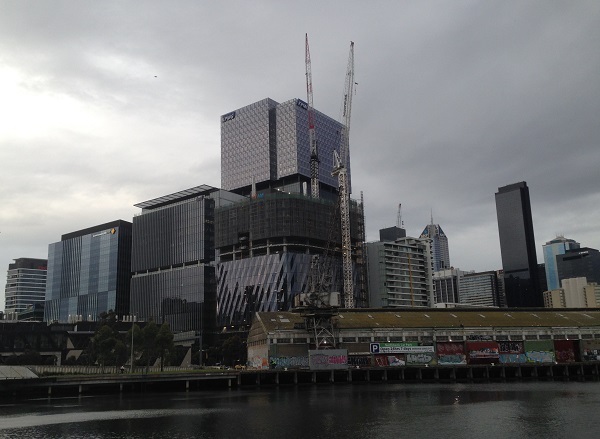 Gloomy skies over Melbourne match the bad news I received there about solar panel quality control. Sandy Pulsford manages the Clean Energy Council’s product testing program which checks the quality of a small portion of the panels sold in Australia. He also oversees the development of their PV module listing process that tracks the almost 14,000 varieties of panels that can receive STCs when put in place by a qualified installer. Before I start giving you the bad news, I’ll tell you the good news. If you bought premium panels from a high end manufacturer they are probably fine, as the manufacturer will be concerned about maintaining their reputation and is unlikely to have sold you rubbish. If you bought mid-range or lower cost tier one panels you may have a problem, but the odds are still good they will be of decent quality and reliability. However, if some slick salesperson managed to talk you into buying solar panels that weren’t tier one and/or from a manufacturer with a reputation for quality, then I am afraid there is an excellent chance you will learn first hand about all Australia’s solar panel quality problem. Sandy Pulsford! He’s our man! If he can’t inform us about Australian solar panel reliability issues, then only a limited sub-set of people can! We were told that many panels out there, potentially including those that are tier one, do not match the descriptions on their datasheets and cannot meet standards their datasheets claim they have been certified for. This can include salt mist corrosion resistance, ammonia corrosion resistance1, and PID resistance2. 78% were under powered and could not produce the watts they were rated for. 45% had substituted components that were different or inferior to what the manufacturer claimed they were made from. Out of 30 manufacturers tested, 5 averaged over 20 microcracks per panel. 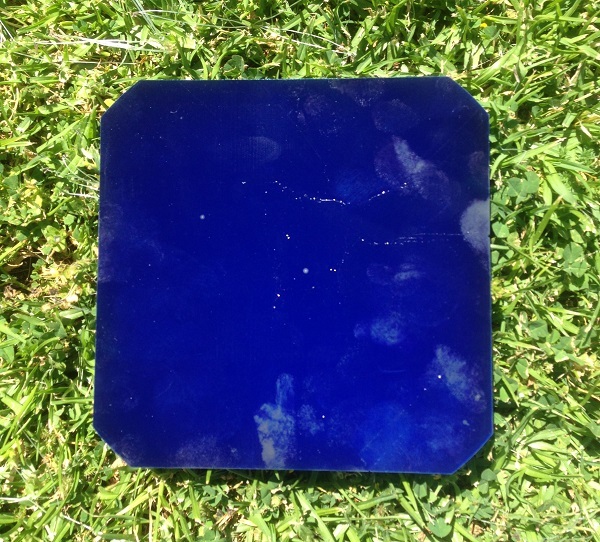 A quality solar panel has zero microcracks. In his talk, Sandy Pulsford described how one model of solar panel can have many varieties made with different components and only the one made with quality materials may be capable of passing tests and obtaining the certifications given on datasheets. If Australian importers don’t specify in writing exactly which variety of panel they want, they are likely to receive a cheaper version made from inferior components. Don’t buy the cheapest panels possible. Pay enough to cover the cost of quality components. Use the full model numbers to order the versions made with quality components that certifications apply to and check those panels are the ones that are received. Pay for agents to be present in the solar panel factories to physically check the panels are made with the correct components and those are the panels that are sent. Not meeting the claims made on datasheets is a huge violation of Australian Consumer Law, but many overseas manufacturers either don’t care or aren’t even aware of the existence of Australian Consumer Law. But given the number of Australian companies that don’t seem to know about it, I guess I can’t be surprised. The CEC doesn’t have the resources to investigate every panel for quality and manufacturer honesty. What they can do is investigate panels they receive complaints about and so have reason to believe won’t stand up to scrutiny. So far they have investigated panels from 30 different manufacturers. As each manufacturer can produce several different models and each model can have scores of variants, I have no idea how many panels in total they have tested. It was probably a lot. In the past 12 months they have tested the panels of 14 manufacturers and 7 failed and have been delisted. This means they have been removed from the huge list of panels approved for use in Australia. In the same time, another 9 panels were delisted for not meeting the Terms and Conditions for panels to be sold in Australia. In some cases this were simply due to a company stuffing up their paperwork, while in other cases companies apparently couldn’t be bothered to do the paperwork properly and have decided that staying in the Australian market isn’t worth the effort. In the latest round of testing, 7 manufacturers had their panels examined and of them 5 had misleading documentation. Why Haven’t I Heard About These Delisted Panels? Unfortunately it takes time for a panel to go from failing its tests to being delisted and we can expect to hear just who the latest rejects are in March. Obviously, it would be better if the wheels could move faster. The damage caused by lousy panels would be lessened if they could be delisted at ludicrous speed rather than ludicrously slowly, but it is probably a matter of limited resources and red tape. Hopefully, the process can be streamlined in the future. There are plenty of people out there who will tell you that a tier one rating is not a measure of reliability, but bankability. Some of the people who are happy to tell you this sell panels that are not tier one. It is absolutely true that tier one only means large financial organizations are willing to lend money to large scale projects that use these panels. But it is also true that no one is going to use solar panels for a large scale project if they are crap. So tier one status is an indicator of quality, but not a guarantee. Tier one manufacturers want to remain tier one and produce quality panels with a reputation for reliability. But they also know people who are spending hundreds of millions building giant solar farms are more likely to pay attention to the reliability of their panels in solar farms rather than on Australian roofs, so the temptation does exist for them to supply cheaper, lower quality, panels to the Australian residential market. Also, the people spending hundreds of millions of dollars on giant solar farms make damn sure they get exactly the type of panel they ordered made with exactly the components they contracted for. This kind of oversight often simply doesn’t exist for panels headed for Australian rooftops. Hopefully, tier one manufacturers care enough about their reputation to have sent decent quality panels to Australia, but there is no guarantee of this. And when a manufacturer runs into financial trouble3 and is concerned about still being around in six month’s time, let alone 10 or 20 years, the temptation to substitute cheaper components will be strong. The CEC found the most problems with panels that are produced at high volume and sold at low cost. In other words, those that are competing on price and not quality. While this category could include the lower cost tier one panels, my personal experience is that panels below tier one perform far worse on average. Included among the worst performers are OEM panels which stands for Original Equipment Manufacturer. In this context, it means panels that were made by a manufacturer for another company that are sold under the other company’s brand. In some cases OEM panels are not a problem. For example the giant company Flex has been making quality panels for other companies for many years now. But these aren’t the panels I’m talking about. Sometimes manufactures who sell decent products under their own brand will use this method to sell off their poorer quality panels to avoid harming their company name, while at other times it is simply a dodgy method for avoiding responsibility. After a few years when warranty claims from selling shoddy panels start to mount up, the company that rebranded them can disappear while the company that made them can keep on producing crap panels. 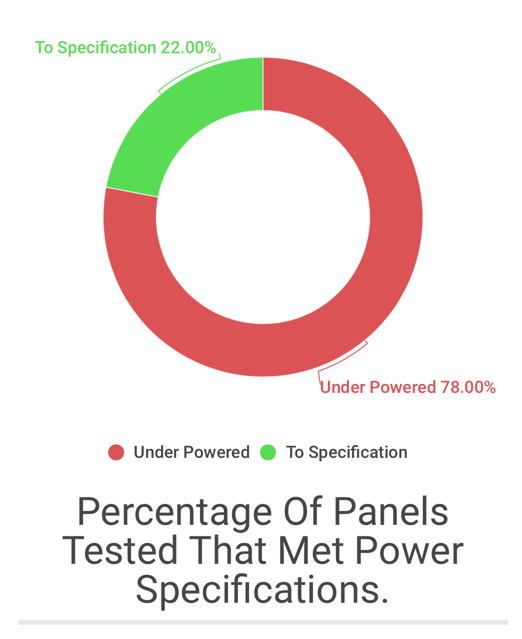 A total of 78% of the panels tested were under powered. This means they did not produce the power they were rated for. This includes the panels’ tolerances. All tier one panels have a positive tolerance. This means if you buy a 270 watt tier one panel it should give a minimum of 270 watts of power when tested under standard conditions and maybe a little extra. But bottom end panels can have tolerances of plus or minus 5%. So if one of these panels is under powered by just 2% the buyer would be paying 7% more per watt than the rating suggests. This will be 7% of the total cost of the system, as other costs don’t get any lower just because the panels are weak sauce. The list of components used to make a solar panel is called its Bill of Materials or BoM for short. One model of panel can have many different variations using different BoMs. Unfortunately, certifications for corrosion resistance, ammonia resistance, PID resistance4, and the ability to pass other tests, will often apply to only one specific BoM. Unfortunately, I can’t think of one single manufacturer that mentions on their datasheets that they produce inferior versions of the same model of panel that cannot live up to the claims they make. It’s bad enough that a manufacturer will sell panels with BoMs that can’t meet the claims made on their datasheets, but of the panels they tested, the CEC found that 45% of their BoMs were fraudulent and the panels did not contain the components claimed. In some cases manufacturers may have swapped out a component for one of equal or better quality and simply neglected to do the paperwork showing the change, but the temptation is definitely there to substitute cheaper components and hope no one notices. After all, the CEC can only test a very small portion of the panels approved for sale in Australia. 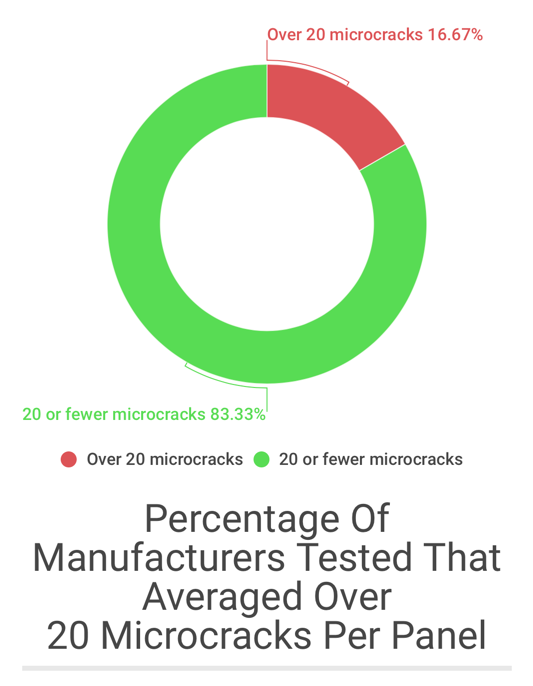 CEC testing found that 5 out of 30 manufacturers had an average of 5 microcracks per panel. The number of microcracks there should be in a new panel is zero. Microcracks are very small and can’t necessarily be seen with the naked eye. Hence their name. For example, I have a solar cell I know is full of microcracks because I put them there with my fat fingers, but if I lay it down flat they are mostly invisible and only the worst can be seen. This solar cell, smudged with my fat fingerprints, has at least scores of microcracks in it, but only the very worst cracks are visible. Each microcrack will cause a tiny reduction in a panel’s output, but that’s just the start of the problem. The tiny decrease in power may not be noticed when the panel is new and the pieces are pressed closely together, but after years on a roof where it will suffer thermal expansion and contraction from changes in temperature and flexing from the wind, those cracks can expand, multiply, and grow worse. They can damage electrical contacts and cause a hot spot to form which can cause the entire panel to fail. If a panel comes with some microcracks rather than none, it can indicate two things. Firstly it is excellent evidence the manufacturer’s quality control is poor and so there are likely to be additional problems and that doesn’t bode well for its reliability. Secondly, it suggests the panel may easily develop cracks through normal transport and handling and this is also a sign of poor reliability. Trust Solar Datasheets? Sure Can’t! 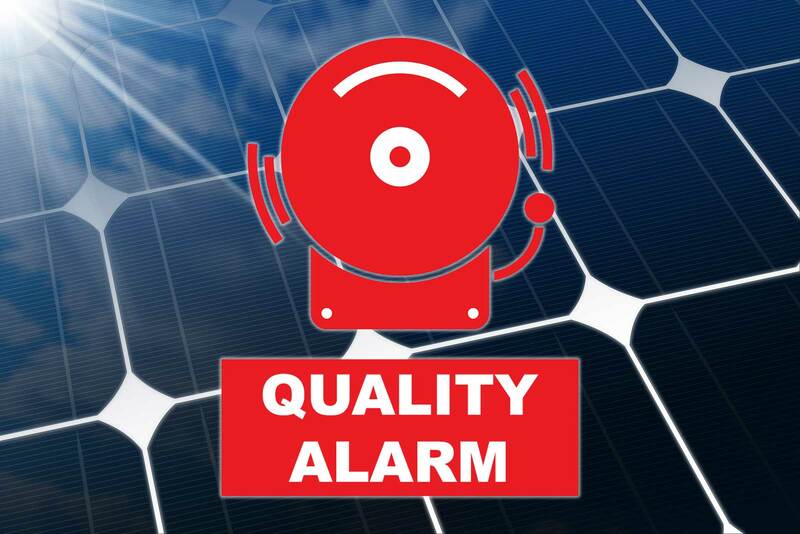 You may think producing datasheets that state a solar panel is certified as being resistant against corrosion or PID and then selling versions of that panel that don’t meet that certification is a massive breach of Australian Consumer Law. And you’d be right. It bloody well is. But, as I mentioned, manufacturers may not care or even understand what Australian Consumer Law is. I’ve talked to representatives of large overseas manufacturers and they don’t seem to have a clue. One cheerfully told me, “Our product warranty is just a piece of paper!” and they can actually become rather distraught if you try to explain it to them5. 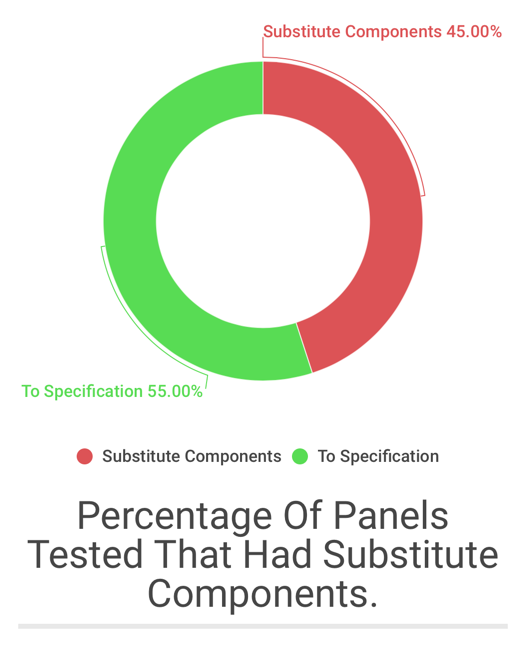 The good news is, the CEC will require datasheets for panels where not every variant has been certified to state that things such as corrosion, ammonia, and PID resistance are only optional or available by request and not a feature of every panel. They will also require all warranties to mention the existence of Australian Consumer Law. Unfortunately, these changes may take 12 months to implement. In order to make sure panels received from overseas have a nice BoM and are actually capable of what their datasheets say they are certified for, it is vital for importers to use the complete model number when ordering them. For Example: Don’t order XYZ P275 panels, order XYZ P275 – 234-987-ABC panels. If you look down the CEC list, you’ll see lots of panels from the same manufacturer and the same power and silicon type, but with a number of different suffixes. Each one has a different test certification. The digits at the very end of a solar panel model number must be written on the order. These final digits specify exact BOM of the panel. So if they are not on the order then they have the option of sending cheaper panels with an ugly looking BoM. If the company they are being purchased from isn’t motivated to maintain a good reputation in the Australian market, guess which are likely to be sent. It’s also not enough to request in writing exactly what you want and to use the correct and full model number when ordering, it is also necessary to check you actually receive what you have paid for, on account of how not everyone in this world is 100% honest. You may be wondering what individual homeowners can do. Well, if you already have panels on your roof that aren’t from a premium manufacturer and aren’t even tier one, then all you can do is cross your fingers and hope they last. There are companies out there doing pretty much everything right in order to build a good reputation and potentially become tier one in the future, so let’s hope you got one of them instead of a company looking to make a quick buck. If you are looking to install solar panels in the future, then the only way to be very confident of receiving what you have paid for to shell out for premium panels where the manufacturer has a reputation they want to defend. If you don’t want to pay for premium panels and instead purchase lower cost tier one panels then you are probably safe, as these companies will still want to maintain a good name, but it’s not really possible for the average home owner to be certain they haven’t received a variant of a panel made with cheap materials. What I do not recommend doing is purchasing panels that are not tier one and not from a reputable manufacturer. The cost of tier one panels is now so low that it makes no sense to purchase panels that aren’t tier one or from a manufacturer with an excellent reputation. The difference between a low cost tier one panel that will probably last 25 years versus one that might only last 5 years can be less than $20 per panel. So no matter what a salesperson tells you, no matter how much German design he says went into the panel, or if he tells you the silicon ingots were organically grown and cut into solar cells by virgins in the Solomon Islands, if it’s not from a well-known manufacturer with a solid reputation for quality — don’t buy it. You are very vague about who is a tier one mfg and who is a premium mfg. You may want to elaborate. There are so many PV module manufactures anymore it is staggering.and more I assume will come to the market as it grows and grows. At the end of the day the only real guarantee of quality ~ and the one I’d pay money for is an ironclad warranty. Way back when the industry was first getting off the ground I a spent month tracking down a useful-sounding installer. As it turned out I knew his family years before. Simon not only assured me he knew what he was doing ~ having spent some time in China himself checking things out, but was happy to sign a warranty that I composed and wrote up , holding both his company AND himself personally (should the company go bust) responsible for performance and durability of the components he chose to use. I paid a lower-end price (though still not cheap back then) for a Chinese-brand panels (Perlight) that were as good as his word and often outperformed their rating by up to 30%. The lesson:- pay as much as it takes, and never mind the ‘tiers’; but get a warranty you can enforce no matter what happens to the company. Get an installer who’ll put HIS money where his mouth is. Very nice wrap on the crap, Ronald. I am an industry representative on the CEC Product review panel and get to see first hand the great work by people like Sandy and also the alarming statistics. Ronald your comments pretty fairly sum up most of the potential issues with the global solar PV supply and manufacturing chain, which I have been involved in various capacities as a resident consultant with the broader Chinese RE industry, including ingot, cell and PV module manufacturing initiatives between 2007 – 2014 having witnessed the full spectrum of known quality issues unfold. There are also PV module related manufacturing shortcomings identified over time, that are simply symptomatic of the new PV technology evolution itself rather than being controllable by any specific quality control strategies alone. Naturally enough end users expect that all those involved at the ‘top levels’ of responsibility in both the manufacturing and supply chains, have in place transparent quality governance systems that minimize functionality and performance risks to LOW levels through to the notional end of life of a PV module; but we should not rest on this wishful thought alone. Can anything be done to minimise the potential PV chain risks, by installers; contractors and independent importers in any practical way? No. This group can only practically rely on best advice available at the time from a variety of sources and roll the dice accordingly. Is there another potential practical process that some other entity could employ on behalf of the Australian PV Industry in general that would be beneficial for the industry and consumers of PV products in Australia? Yes. The CEC should continue doing what they are currently doing, plus they should consider engaging directly with the broader Chinese PV manufacturing industry by conducting a series of informative and targeted presentations at select venues in China involving key manufacturing stakeholders. There are some very real opportunities available to facilitate such a dialogue and relationship building strategy at the moment between the two countries, under the Chinese ‘one belt one road’ umbrella. This would prove a much more effective strategy than appealing to local Australian installers and businesses to exercise some form of imaginary responsibility or influence over international PV manufacturers themselves, which is simply not feasible and an impossible expectation. Without denigrating the report, sometimes, the reasons given for photovoltaic systems not always performing to maximum possible capacity, appeared to be deduced by the expert (as in drip under pressure), Mr Feekle Matter. I recently, in trying to find whether I could get additional photovoltaic panels added to one of our systems (the panels that I seek, are apparently, no longer available – the manufacture and supply of photovoltaic panels, appears to be erratic, unreliable, and, unsupported, making buying a domestic rooftop photovoltaic system, a bit like buying a lottery ticket, or, betting on a horse – you never know your luck – you MAY be lucky), I was told, quite adamantly, without the person visiting the site, that the sole reason that we do not get above 80% efficiency, is that our panels are no good. I told him, that he was completely wrong, given that one array faces about WSW, and, the other arrays, ENE, so, we do not have the “optimum” orientation, on any of our installed panels. Both arrays work as well as they can, for what they are, given their respective orientations, and, explanations of their lack of achievement of efficiency (relative to their nominal maximum capacity) of 100% , without examining their respective orientations, is pure product of the expert (as in drip under pressure), Mr Feekle Matter. Heavy wall 50 mm gal pipe. Frame will outlast any roof I have ever been on by 20 years at least. Been using this format for many years now (when and where appropriate) and have never seen a spot of rust develop anywhere! We also have a SS solution for some specific needs projects. I am not in favour of your pine timber design though. Hardwood – sure. The industry needs the same report / advice on batteries to inform installers and consumers before the big influx on batteries. Talking from experience, I just replaced Aquion batteries after 2 yrs that didn’t come close to their data sheets. I have been warned off lithium ion and told not to take my new lead acid gel (high quality) past 50% DoD if I wanted the batteries to last past 10years, even thought they are rated for 3000 cycles at 70% DoD. Trevor your suggestion is not the right way to go. Many practitioners in the RE industry, undeservedly believe they know enough about battery technology in general, to dip a toe in the water and represent their ideas and views to potential customers, actually believing what they are saying is bullet-proof science, but unable to offer any engineering analysis to justify their views – rather than merely hearsay; hype or scuttlebutt. The result, like that you and many others have experienced over time being the ESS wheels start to fall off well ahead of schedule. This situation will continue to be the norm unfortunately until installers start to take more responsibility for RE system performance outcomes, by investing in themselves through formal professional skills development and qualifications training in ‘RE Solutions Engineering – Integrating and Managing ESS’ and similar specialist fields which should be embodied in the national technology training policy. Until this strategy gets a foothold, there can really only be one inevitable negative expectation (exposed over time) for RE + ESS system owners. Manufacturer warranties means nothing, had this trouble with JA SOLAR panels developing snail trails on top of the cells (fusion burns) JA SOLAR says we have to prove that the output of the system has dropped. The process of testing each affected panel by a qualified installer over a period of time would cost you more than what the system cost besides the owner of the system has to bare the costs of shipping the faulty panel back to China as well as the shipping cost of the replacement back to Aus IF FOUND FAULTY. Panels have only been installed for 4 years and the performance has dropped dramatically, up to 75% of panels in some systems have been affected. One can only imagine the disappointing affect it will have over the 25 year “Warranty Period” if they even last that long. I hope JA SOLAR are on the CEC watch list. You are covered by Australian Consumer Law, which is much more comprehensive than the written warranty you have. Consumer guarantees require that products be safe, lasting, and have no faults. Panels with bad snail trails are not going to last and it is clearly a fault. Under Australian Consumer Law you do not have to ship panels back to China to receive a remedy. It is also possible to claim consequential losses, which are reasonable, predictable costs resulting from the failure of a product. I have a suggestion for what you can do, but frst I will state that I am not a lawyer and this is in no way professional advice. This is just my personal opinion on what you can do based upon reading pamphlets on consumer law. What you could do is monitor the output of your solar system and if you have reason to believe it has declined, send JA Solar’s Australian office photographs of the solar panels with snail trails, including any visible hot spots or other damage that may have developed, and inform them that under Australian Consumer Law you are entitled to a remedy. Tell them that if you can’t arrive at a satisfactory solution you will take them to a Consumer Tribunal or Small Claims Court where you will claim the consequential loss of having an installer inspect the panels and write a report on their performance. Thanks for this Information Ronald, I will pass it on to others that I know have had issues with their JA Solar panels. Would save a lot of time if the ‘rouge’ manufacturer’s names – and also the best manufacture’s name were exposed. There seems little point in espousing the virtues of some manufacturers and lamb-blasting others with just a series of confusing arguments. We’ve had a stand alone solar power system operating since Feb 2003 and I’m happy to share the experiences we’ve had with the installation of Solar Panels during this time. Panels initially stalled were 4 BP, (fail) & 12 Kyocera (fail). 6 Sharp (fail) and 8 ‘No Name’ brand panels (ok) were subsequently added over time. 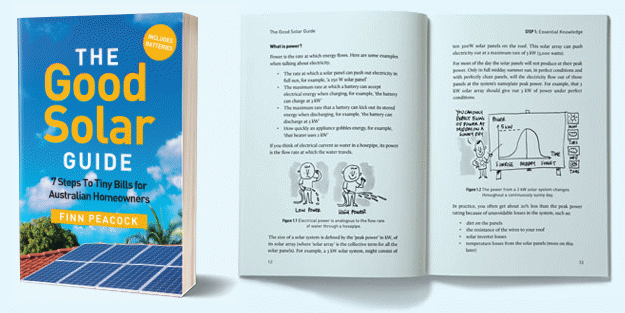 After experiencing complete panel failure in three of the BP panels within two years, my advice is to steer clear of them – although I’d doubt whether you cab now purchase BP panels….and no wonder! We dumped the fourth BP panel even though it was still performing, in the expectation that it would soon fail – as had the other three. All 12 Kyocera panels fell well short of producing the required wattage after approximately three years, with two in particular failing to produce any power at all. All 12 were replaced under warranty and I must admit, the replacements have exceeding expectations. Believe it or not, a series of blown fuses indicated after testing by the installer, that the panels were in fact, producing MORE watts after ten years than first installed. Go figure! Despite the initial glitch, Kyocera are probably worth installing. After seven years, the Sharp panels are showing signs of snail trails, but are still producing adequate power for their age. How long this will last is anyone’s guess. The 8 ‘NO NAME’ panels were part of a batch which were surplus to requirements, courtesy of a large company who installed solar power systems throughout the country – and at a price we couldn’t refuse. They’ve been installed for nearly four years and so far, seem to be performing well. In our experience – we would not recommend BP or Sharp panels. Well done article Ronald, I write from Italy (Florence) and let me say that I could not find such a useful article. Many useful tips for an intelligent purchase. Could you tell us where I can find information on tests performed by CEC. eg. delisted panel, microcracks and underpowered panels? the Biotechnology industry get away with something like this.